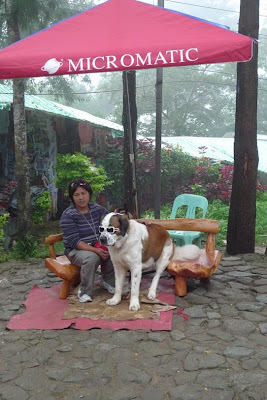 st bernards are actually pretty docile. plus, so long as dogs are socialized with other dogs and with people, they rarely behave badly. Growing up in Baguio, I could say the same thing. It used to be such a cozy little city. I was wrong when I thought I could go back for relaxing nostalgic breaks but it's turned into such an, well, ugly place. If you're feeling a little adventurous with accomodation, I'd suggest staying in 'Ating Tahanan' in South Drive in pinewood paneled, self catering flats and the area's still surrounded with pine trees and still has that cool climate. It's one of the few places that still has the 'Baguio' feeling.